I have to admit when it comes to pushchairs, I have a weakness. An infalliable lust that keeps me wanting to see what each and every one of them can do, where they can go and the different adventures that can be shaped. My latest test subject is no other then the Petite Star Njoy Bubble. This light weight stroller is one of a kind on the design front, I have never seen a stroller like it. Well! it is an umbrella fold combined with a reversible seat allowing this stroller to be parent facing or outward facing! The beauty of it is that unlike other strollers that boast parent facing (my favourite feature in a pushchair) you can alter the position of the seat unit without removing it from the chassis. I have always loved having Leo face me while we are out and about, over recent months he has been facing out into the wonderous wide world but when the Bubble arirved I could not resist taking Leo out in the parent facing mode. We walked around Tesco grabbing the essentials having a lovely little chit chat and Leo used the words that he knew to chatter back to me, very content facing me all the while. The seat positioning is operated by a handle at the top of the unit and you will find that it is the same handle that reclines and inclines the seat. In both parent and rear facing positions you can lie the seat flat, so that when the little rugrats fall asleep you can cosy them up and give them their full sleep out. Putting the Bubble together is simple as all you need to do is attach the front wheels by popping them into place and attach the hood. At first I found the hood a little fiddly but once I got it lined up with the runners correctly I realised how easy it really was. With all four wheels now in place and the hood attached, that completes the assembly process for the Njoy Bubble. With the Bubble now completed in front of me I looked it up and down forming my initial impressions. The ice white of the aluminium frame looks great against the black material of the hood and side panels, and the electric purple seat unit adds a welcome splash of colour to the stroller. At first I wasn’t too sure if I had fitted the hood correctly as it felt a little wobbly, but as the hood is made entirely out of Nylon fabric and moves with the positioning of the seat it does need the leeway. I have found that due to this the hood does not feel as supported and sturdy as on other strollers I have tried but it is a generous size offering shelter from the elements. The seat unit offers the passenger lots of room to stretch out and enjoy the ride, and with the included head hugger it is possible to use this stroller from newborn. What I especially liked about the seat was that you can sit it upright with the incline, with some strollers I have found that leo can never sit completely upright as the incline doesn’t go that far forward. Leo likes to sit up and see everything as we go around, and we often have a struggle if I dare recline him before he falls asleep! So for us this is fantastic, and I know if Leo could he would give it a big thumbs up! When out and about with Leo I do still tend to have a changing bag with me, especially if I am out for a rather long day, if I have Leo in parent facing mode then there is not really anywhere that I can hang my changing bag, and I do worry that if I do hang anything off the handles that I risk tipping the stroller as it is very light. There is a shopping basket based underneath the Bubble but due to the seat design it is rather fiddly to get to. Petite Star have compensated by adding a zip on either side of the basket so that you can have better access but the space available is still rather tight and realistictally you probably wont get anything in there other than the raincover. Now I have already mentioned that this is a light weight stroller, but I don’t feel that this gives it the justice that the Bubble deserves. The entire stroller is incredibly light, even with my 18 month old in the seat, it is effortless to push and goes up curbs like a dream. 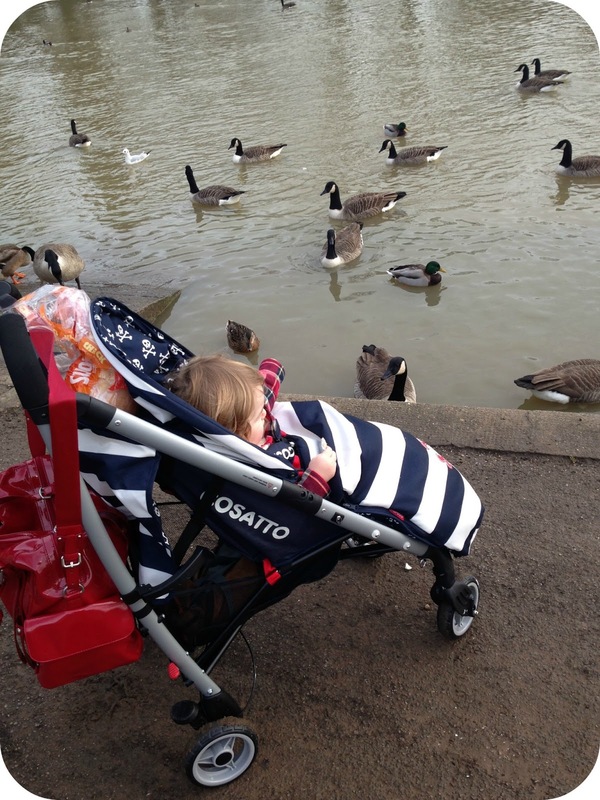 As babies grow into bigger babies, and then into little people it gets harder to cruise them around with their weight becoming more apparent they often weigh down the stroller… So the Bubble is a great choice for those of us who have older babies who still need a pushchair. Leo is far off being able to walk for the duration we are out and we do still need a stroller. This pushchair is light enough for me to push one handed, so while I have Leo on the reignes I can still keep up with him and control where the pushchair goes! And when Leo’s little legs get too tired, he can go straight back into the Bubble for a rest. 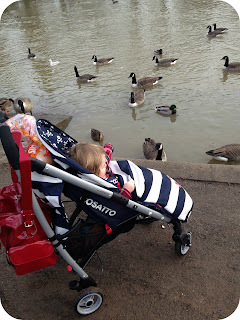 Over the last 15 months I have had the pleasure of trying various different strollers, and one thing I find very important is the ease of putting it up and down. After all this is something that you will be doing on a very regular basis and you don’t want to be faffing with fiddly elements. So I am pleased to report that this umbrella fold stroller is very simple to put up and down. 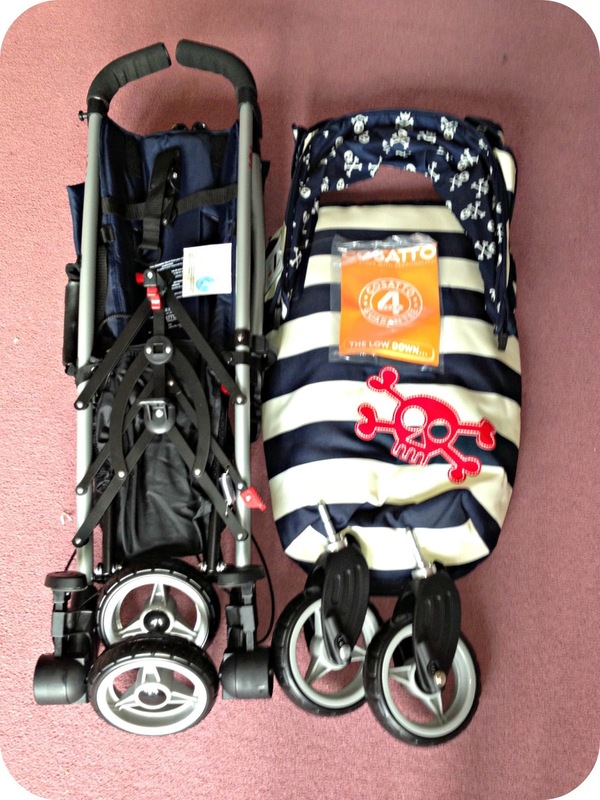 It is very similar to other umbrella fold pushchairs that I have used and simply has a push up button in the middle of the back frame, and a push down switch on the right hand side. Then by pushing the stroller forward it collapses and automatically locks with the clasp on the side. You can fold the stroller in both seat positions and don’t have to fiddle around to alter the seat before collapsing it, and the collapsed stroller is the perfect size to fit easily in the boot of my 206! Putting the stroller back up is just as simple, by firstly releasing the clasp and pushing down on the middle pedal at the back of the stroller to re-tension the frame. When I first touched the EVA foam wheels I will admit that I wasn’t to sure of them, you could maybe even say I didn’t like them. However after giving this stroller a real test run I have been forced to change my mind. The wheels run smoothly providing you with great control! 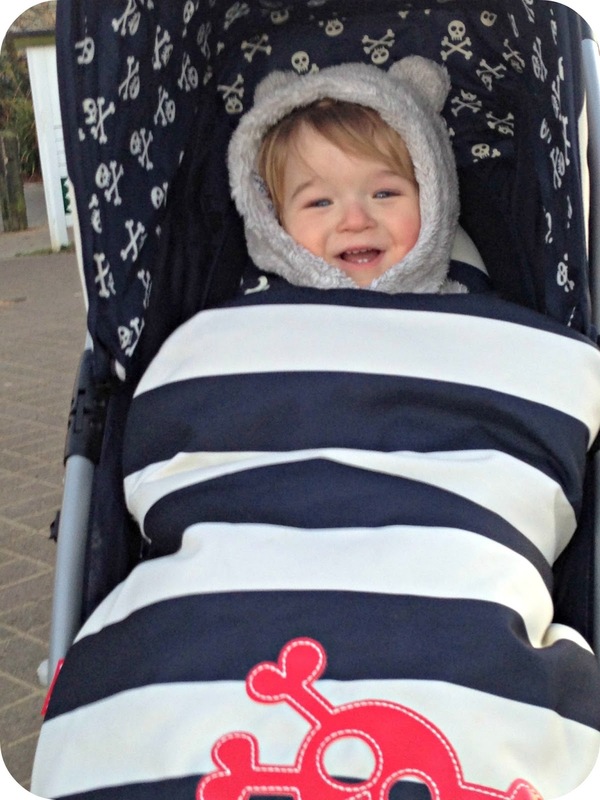 The raincover fits the pushchair securely in either parent facing mode or outward facing. When the raincover is on it gives Leo plenty of room to manuever and stays out of his way. I have been storing the raincover in the basket so that it is always there if we suddenly need it, which with the British weather is always a possibilty! Over all I think this is a fab little stroller with big capability. I know a lot of parents want the oppurtunity to be face to face with their baby while out and about so this feature is a big attraction. Petite Star really have done themselves proud with this nifty little number, by providing a stroller that can be used in both parent facing and outward facing positions without the need to remove the seat from the chassis and it is bound to be a big success! With the added head hugger you can use this stroller from birth and realistically you will only need one pushchair. For £199.00 RRP this is a very attractive price for a pushchair that has the potential to carry your little one through to a time when you no longer need a pushchair. Disclaimer: I was sent the Petite Star Njoy Bubble for the purpose of this review, however all opinions expressed are completely honest and my own. A Belated New Years Resolution! January is the month that you make or break your New Years Resolutions, and honestly…I don’t think mine ever took flight. My resolution to myself was to eat more healthily (less of the chocolate gold!) and to somehow find time to exercise and maybe even go to the gym a couple of times a week. Now don’t get me wrong I am not heading for a mass diet, I am in my pre-baby clothes and have been since I brought Leo home from the hospital (please don’t hate me!) but I really want to get toned again. Now although I am yet to give up the chocolate, I am mentally preparing to do exactly that! Maxitone have given me the final push and of course the motivation to give my New Years resolution a chance by sending me a very generous box of goodies. Now before I can start and make the very most of everything that I have been sent, someone really needs to tell my tummy that Christmas is over and there is no more excuse for me to be munching on the naughty goodness, oh and let’s not forget the occasional tipple of Malibu and Coke! Maxitone must have heard me pondering how I would fit in the time to head out to the gym, or the dilemma I have with finding the motivation to leave the house in an evening as they have included a Power Ball Kitl and a DVD to work out too. 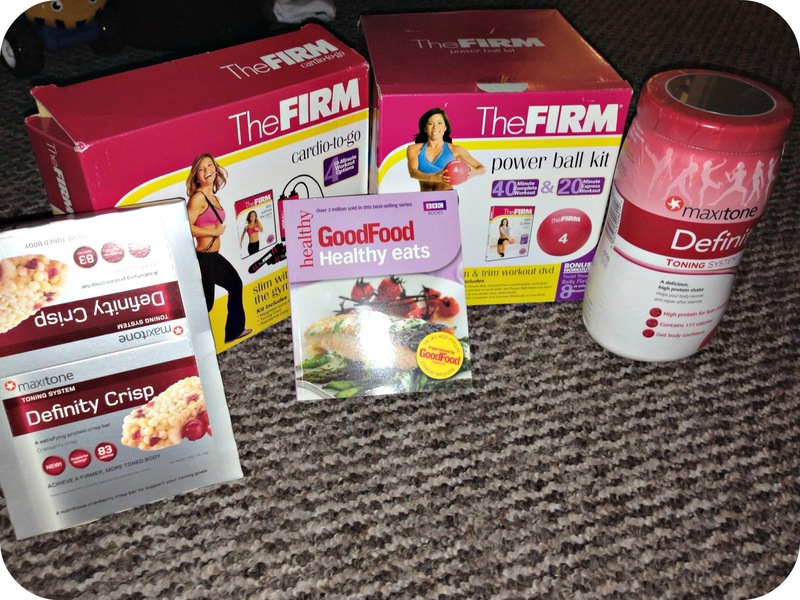 They have also included a Cardio To Go Kit and DVD and although I haven’t had chance to use it yet, it is going to make my chances to exercise so much easier as I can do it through Leo’s nap time in the comfort of my own lounge. To help with the exercise that I WILL be doing, Maxitone have included their Definity Shake, a high protein drink that is ideal for drinking straight after your work out to help your body recover. They have even anticipated that I may like to snack, all be it a healthy alternative! Sculptress bars are a nutritious high protein snack replacement, so I can wave bye bye to anything that may want to distract me from the mission in hand. Getting toned! So yes I have opted to start a New Years resolution a little later than everyone else… I did in fact have a Mcdonalds for lunch…However from this moment I am going to be skipping and donning my weighted ball, choosing a healthier lunch option and hoping that by shear determination I will be able to get the tummy back that I was once rather proud of! So here it goes….Wish me luck! I have a feeling….I am going to need it! Win a LeapPad1 with LeapFrog! 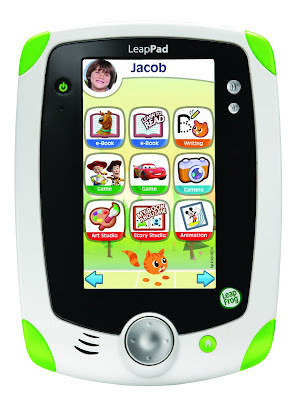 I am very excited to share with you a chance to win a LeapPad1 for your little one with LeapFrog! The LeapPad1 is the original learning tablet just for kids and has some fantastic features that have been tailored for children 3-9 years old! - Motion-based gameplay and a built-in microphone and camera/video recorder. - There is a library featuring hundreds of games, digital books, videos and flash cards (LeapPad1 works with all LeapFrog Explorer™ games and apps). - It comes with a whopping 2GB of memory, enabling little one to build up a robust suite of apps! In 2012 the LeapPad1 was the winner of the most Educational Toy of the Year, Preschool Toy of the Year and overall Toy of the Year! The LeapPad1 retails at £79.99, and for your chance to win one all you need to do is follow the Rafflecopter form below! Please only enter this giveaway if you live within the United Kingdom. A winner willl be chosen at random on the condition they have completed the entry form honestly.Once a winner had been chosen you will be contacted via email, if you do not respond within 48 hours another winner will be picked at random and the original winner's notification will not be valid. Last winter snow didn't fall, well not memorably anyway. Any attempts were thwarted and didn't provide any snow fun what so ever. 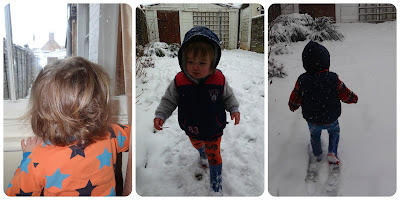 This meant that Leo's first winter came and past with out any snow, taking us into his second year having never really experienced the excitement that comes with the cold weather! January has brought with it plummeting temperatures and even sprinkled the white stuff that I have been longing for. Snow! When Leo awoke last week it was to a winter wonderland, in my haste to get him to the window I whipped up the blind so that he could see outside,past the icicles and falling snow flakes. Leo stared taking in the magic that he was beholding, slightly dazed and confused but mesmerized none the less. I told him it was snow and asked him whether he would like to go outside and experience his very first snow fall. I was met with the familiar shake of Leo's head...He was telling me he did not wish to go outside and that he was happy watching it fall from the window. 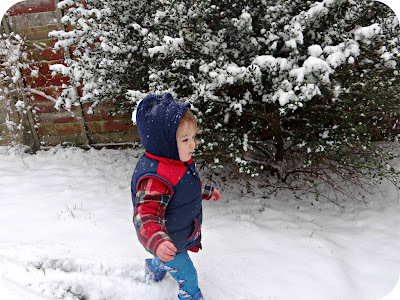 I got him ready for playing outdoors anyway, and before I knew it I was slipping his wellies onto his feet so that we could hit the icy blast that had descended upon us! 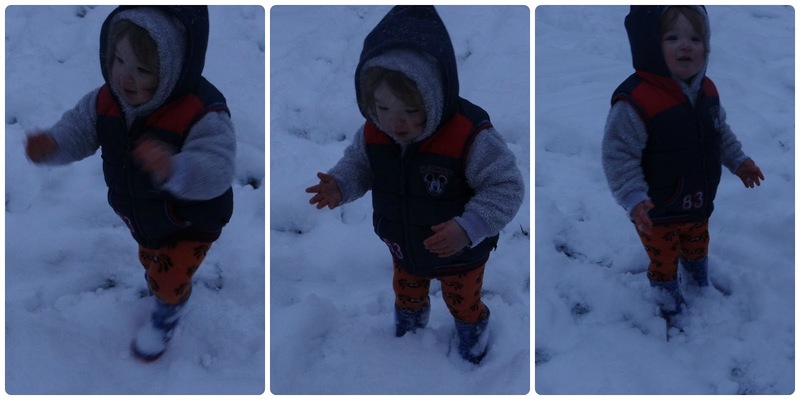 We got into the garden and Leo was running around enjoying the crunch of the snow under his feet, I followed him and watched him taking in this new experience. 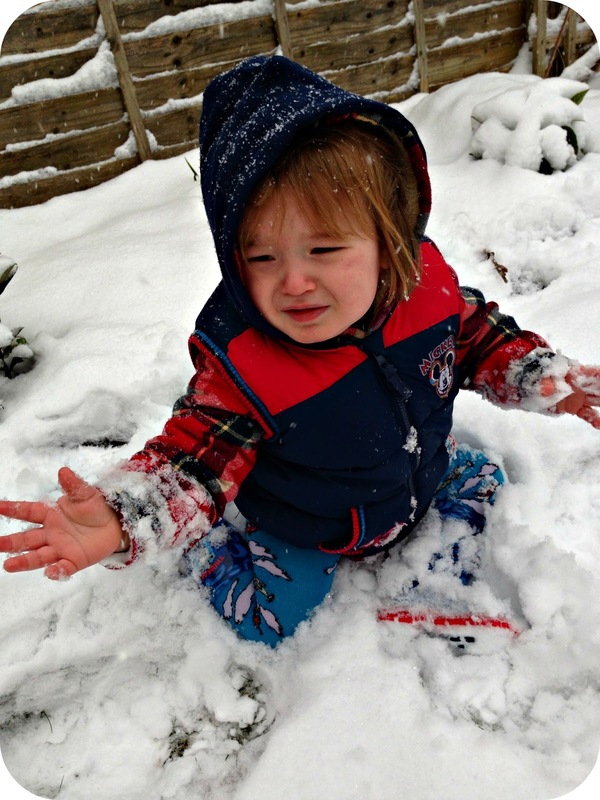 All was going well until Leo took a tumble and realised just how cold the snow was against his warm skin, and that was when he decided he disliked the snow. Coming back inside Leo stood at the window watching the continuous snow fall shaking his head in a disapproving manner. 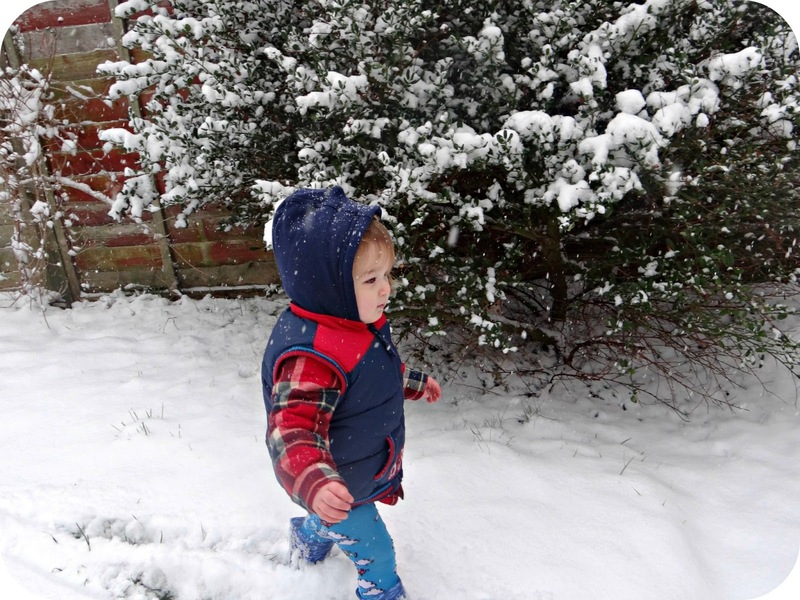 Leo's feelings seemed to warm toward the snow after warming up, and he soon brought his wellington boots back over to me so that we could head back out into the garden. The relationship was soon back on track and Leo reverted to running around listening to the now familiar crunch of the snow under his boots. Leo was not interested in picking the snow up with his hands, he was content with just being outside and running around the garden. I soon realised that Leo didn't wish to come back inside for love nor money, despite his hands and nose being freezing cold, when he guessed that I was calling time on play time he screamed his toddler scream and went rigid so that I could not bring him inside. When I got him through the door he let out the menacing temper tantrum that pierced my very being. Leo has loved having the snow, and my only regret is not getting to build him his very first snowman. This of course will be on our to do list for next time! The snow brought with it magic and excitement, and allowed my little man to thouroghly enjoy hinself. 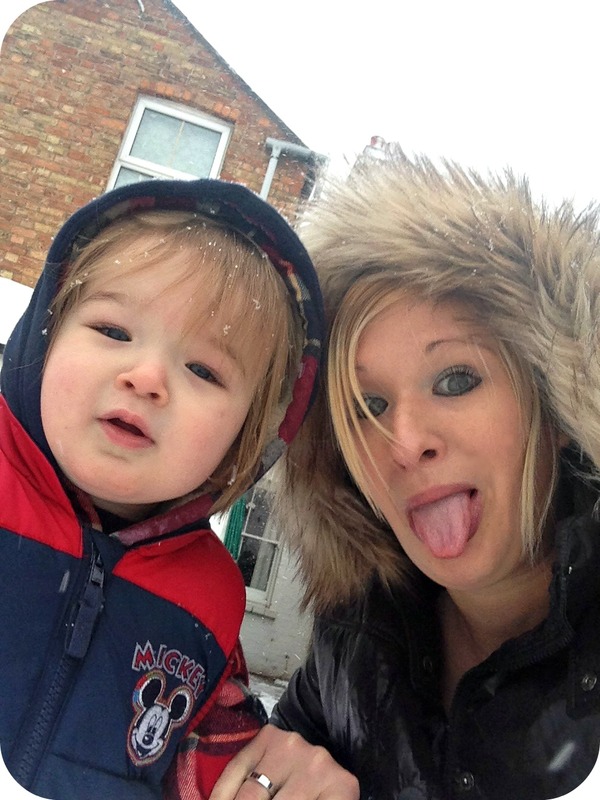 So despite all of the disruption that snow brings with it, it also makes many little people's dreams come true! And next time we will make sure we have a sledge at the ready! How were your snow days? The Cosatto Yo! Ahoy Review and Giveaway! It will come as no surprise to any of you to know that I love my role as a Cosatto Brand Buddy. Cosatto truly are a brand that I whole heartily adore, from their cheeky designs to the bright colours, they have the power to brighten the dullest English day! In my latest mission set by Cosatto, I have been tasked to trial the new limited edition Yo! Ahoy There! Of course this is a task I didn't have to question and welcomed with open arms. I am no stranger to the Yo! after putting the Pear Drop through it's paces in summer 2012 I was very excited to try out the latest model. The highlights for me have to be the ease of use and the overall simplicity the Yo! and not to mention that it always seems to turn heads while we are out and about. The Techy bit...Before the exciting bit! 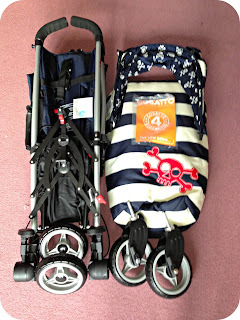 Cosatto are so very generous with the accessories that come with their strollers and the Yo! Ahoy There is no exception. Putting together the Yo! Ahoy There is really easy, and I am not just saying that because I have had practice! Before you can take your new wheels out for a stroll around the town you just need to pop each of the wheels onto the chassis and attach the hood. And that was that, Leo’s fancy new pirate pushchair was all ready to hit the 7 seas with, or…the flooded river Avon as it was at that point! The Yo! has many different designs but I have to say out of all of them this is my favourite. In traditional Cosatto style this stroller is cheeky and ready to turn heads. Set on an aluminium silver frame with white and navy stripes and a vibrant red skull and cross bone in patent, passers by can really see that trouble is coming their way, and then they see Leo…boy they know he means business! The inside of the hood boasts more skull and crossbones on the navy back drop in flashy white. The outside of the hood is again donned with the navy and white stripes completing the daring attire. The one thing I am missing from the Ahoy There that was featured on the Pear Drop is the peek a boo window. I liked being able to see what Leo was up to when the hood was up, but that aside I have noticed that the hood sits better without this window. The Yo! is an umbrella fold stroller and is one of the simplest pushchairs that I have ever had the pleasure of putting up and down. It takes seconds to set the Yo! up and get it ready for action, and it takes seconds to put it back down again. But when you have your Ahoy There all ready for a trip you can rest assured that it is more than fit for the task in hand, it is such a sturdy stroller and from my personal experiences it has served me well. I have to admit I have hung many a shopping bags on the back of the Yo! and it has stood strong, serving me and Leo proudly. When the Yo! is collapsed it is quite long lengthways but I can fit it in the boot of my 206. It just about goes in lenthways, but I do still have plenty of room for other bits and pieces. My sister in law also has a Yo! which she is using with her 12 week old son, and we have managed to fit both of our Yo’s in the boot of my car! So that just gives you an idea of space. If you do require more space you can easily take off the front wheels to give you the extra room. The Yo! allows Leo to sit completely upright and take in everything around him, he loves to be nosey when we are out and about so this suits him down to the ground. He sits contently in his seat while we feed the ducks together, not that he throws the bread for the ducks to eat, he is happiest when eating it himself. 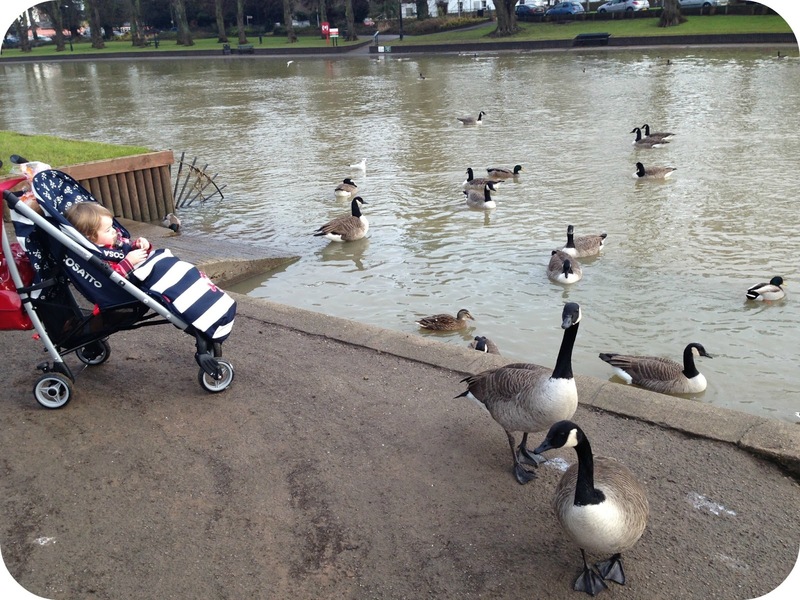 Leo loves watching the ducks milling around to get the bread and is completely safe in the fantastic Yo! seat unit that features a chunky 5 point harness. The harness can be adjusted ever so easily to one of three different height settings as I have discovered since using the Yo! with Leo. The buckles can be a little stiff when they are straight out of the box but they loosen up over time. The back of the seat unit can be reclined by using the straps that can be tightened and released by a simple clip. By tightening the straps the seat will incline and by pulling the strap loose it will recline. Once you have found the desired position you simply snap the clip back down to hold it in place. The Yo! Ahoy There has a fully lined hood with a UPF factor of 50+, this is great for the summer months (if indeed we get some sunshine!) The hood is sturdy and casts Leo welcomed shade, but with this winter sunshine it can sometimes go right into his eyes and the hood cannot be adjusted to accommodate for this, but Leo doesn’t seem to mind too much and it is not long before we change direction and it is no longer an issue. We take the Yo! on many of our adventures as it is such a easy to transport stroller, Leo can nap soundly in it and he sits comfortably watching the world go by. The Ahoy There has been to the park and down by the river, it has seen many a shop and even endeavoured further to help me with my purchases. When Leo no longer needs a stroller I am going to miss the big welcoming shopping basket and handy handle bars to hang my bags. It begs belief, but one day I may actually have to carry my own shopping! Or arrange for baby number two to arrive around that time!? The shopping basket is readily accessible and is a really generous size. I can take out everything I need in the basket alone so on occasion I don’t even need to take a changing bag! Being winter we are currently sporting the included cosy toes, and it is doing a mighty fine job of keeping Leo nice and snug on our travels in the frost. The cosy toes is soft and fleecy on the inside and waterproof on the outside, as we discovered when we got caught in a torrential down pour! 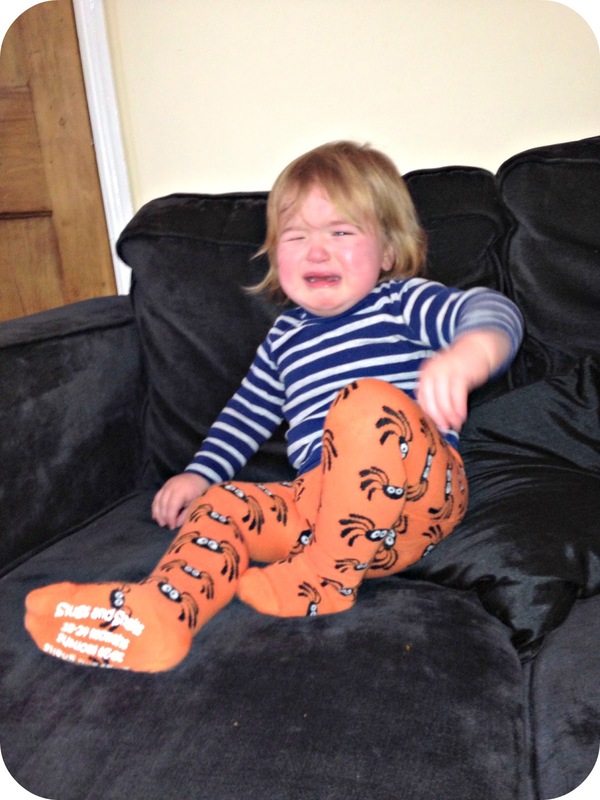 The cosy toes can be completely un-zipped and the bottom section can be used as a reversible seat liner. The seat liner provides an extra layer of padding to your little one should you choose to install it. It can be used throughout the summer so that those sneaky naps in the Yo! are even more comfortable. With the summer and winter we have had on the rain front you will be very glad to hear all about the very handy rain cover that is included with the Yo! Cosatto have obviously been vigilantly watching the weather forecasts and seeing a familiar pattern of ‘rain, rain and more rain’ popping up. So to compensate for the rainy forecasts Cosatto have developed the rain cover a nifty little bag that attaches to the frame of your stroller. This means that it is always within easy reach for when the sky’s open and the heavens fall. The bag is in the colour coded with navy and white stripes to in-keep with the pirate design. What do Leo and I think over all? I have thoroughly loved the Cosatto Yo! Ahoy There, and it is no surprise as I love my Pear Drop equally. Leo goes around in style even when he is with his Granny as she now uses the Pear Drop for Leo while I am at work. 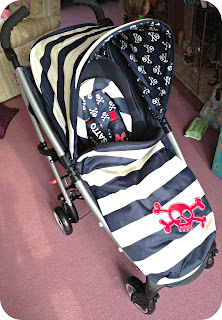 As for the Ahoy There I adore the cheeky new design that has been applied to the stroller. Leo has a comfortable ride and demonstrates this by having a snooze when ever he feels like it, and I find it a joy to push around. The padded handles make it easy to grip and the entire manoeuvrability factor of the Ahoy There is second to none, I find it so easy to navigate and I know I have the front swivel wheels to thank for that! The Yo! Ahoy There is priced between £220.00 - £250.00 depending upon where you buy it. All of Cosatto’s products come with a standard 4 year guarantee so it is very worth registering your product with them via the form enclosed in the box. For a full list of stockists please visit the Cosatto website. I am very pleased to be able to offer one lucky reader the chance to win their very own Cosatto Yo! Ahoy There! All you need to do is enter via the Rafflecopter options below for your chance to win this cheeky stroller for your little one! Disclaimer: I was sent the Cosatto Yo! Ahoy There for the purpose of this review, however all views and opinions expressed are completely honest and my own. When I go to events within the blogging world I always like to carry with me a business card or two, you never know who you are going to meet and I do like to be prepared. Instantprint offered me the fantastic opportunity to design my business cards with them, and asked me to open up my creative flair to see what I could come up with. 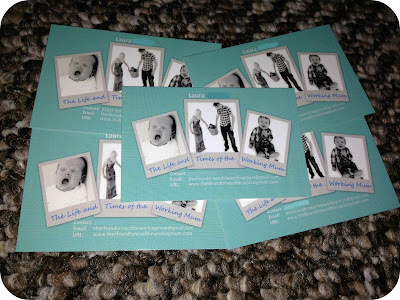 Of course I accepted their generous challenge and began to design my new business cards. I wanted my blog to reflect the business cards and wanted my header to be a feature on the card, so that is exactly what I went for. The cards arrived last week and I was excited to see how they had come out, they looked great and the quality of the cards was top notch. I have ordered cards from companies before that have not provided great quality card, but Instantprint have printed my cards perfectly. Now I have the finished cards I do wish that I had made the font bigger as although it looked large on my design, the finished print is obviously on a smaller scale so in the future I will need to take this into consideration and that is more a quibble with my design technique rather than Instantprint’s printing technique! 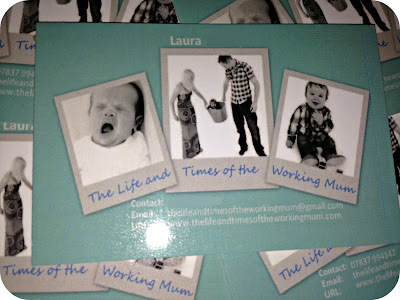 Over all I am very impressed with my new business cards and I will certainly be using Instantprint again in the future. Their prices are really competitive and you can get yourself 1,000 business cards from £16.00 - £21.00. Disclaimer: I was provided with this opportunity by Instantprint and received 1,000 business cards to review for this feature. However all views and opinions expressed are completely honest and my own. Mothercare have had a very busy year, launching their new blog only a few short months ago and now they have just launched their very first iPhone app. I was lucky enough to be invited along to the official launch in London back in December, where Myleene Klass unveiled the app to an eager crowd of journalists, and of course little old me! The new Mothercare app has a whole array of great features that will help any parent or parent to be on their journey into parenthood and beyond. You can personalise the app and tailor it completely to you, if you are pregnant you can enter your due date or your child’s birth date and above all else it is so simple and easy to use. Baby Tunes features music and whitenoise for bump, baby and growing children. This is a fab part of the app as back when Leo was born I paid for an app that had much less than this, and Mothercare have included it for free! 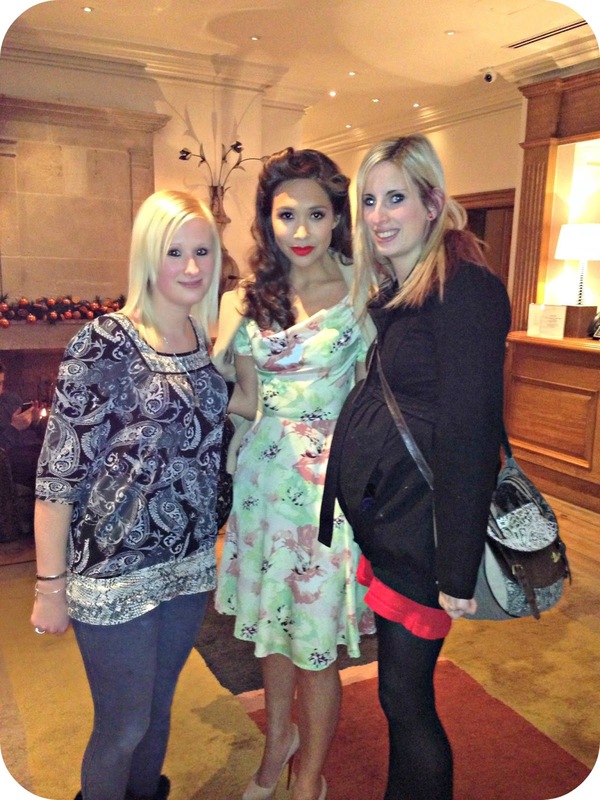 Mothercare tv features advice from a great array of people such as Zita West on trying to conceive to Myleene Klass and her own personal experiences with her little one! A really handy bit is the section on breastfeeding, I know this would have been very welcome in those early days with Leo. There is a great section on ‘Pregnancy week by week’ that shows you how your baby is developing from one stage to another. There is an ‘information’ section that tells you everything about your current gestation, what to expect and sometimes what you wouldn’t expect! When I was pregnant I loved following each stage of pregnancy and reading all about what was going on inside, I wanted to know how big baby was and what he was learning to do with each passing week but I soon ended up with dozens of different apps that did different things, and I longed for one that had everything all in one place. Being pregnant was completely alien to me; I had no idea about what I would need from packing my hospital bag to what my baby would wear! I spent many hours sat at the computer on Google trying to work out what I would need, and what I wouldn’t. The Mothercare App has checklists that will tell you exactly what you will need in your hospital bag for both yourself and baby, baby clothes that are essentials, and even things you will need or covet during pregnancy. Mothercare seem to have a list that fits every occasion and I know that it would have been a godsend to me back then, and would definitely have reassured me that I did have everything I was going to need. 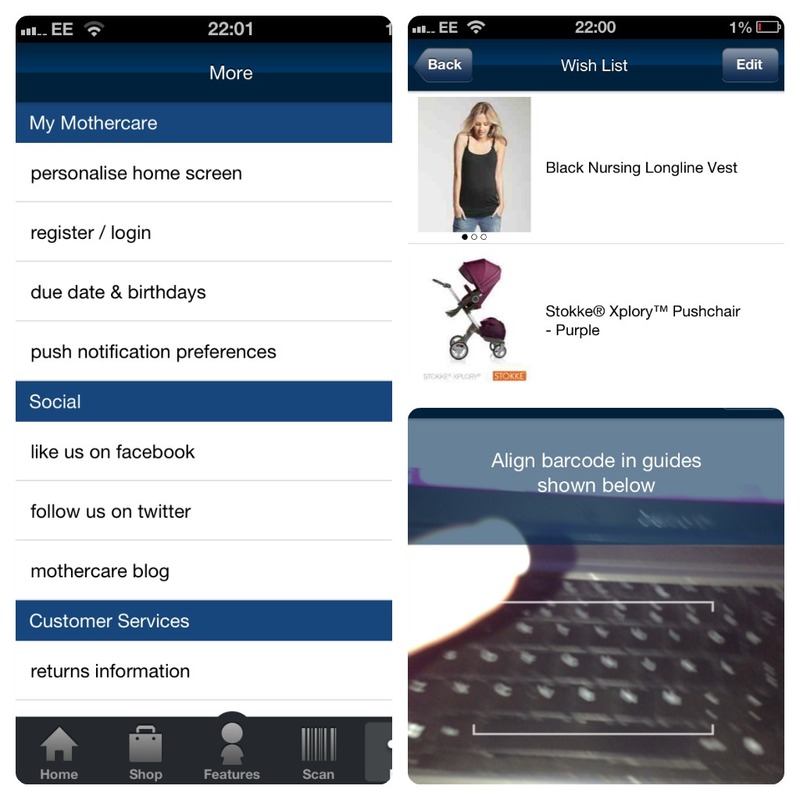 The app allows you to shop directly on Mothercare from your iPhone or iPad, and a lovely feature is the wish list function. The wish list function runs along the product pages so that when you find the perfect item you can favourite it by clicking on the star icon. The item you have selected will then appear on your home screen in ‘my lists’ under ‘wish list’. You then know the exact product that you are looking for and can come back to it at any time. Now if you read the Mothercare blog then you may have come across a post I recently wrote about the difficulties we faced in naming Leo. Any pregnant Mother to be is going to spend so much time going over names, changing her mind and then also trying to keep up with Dad who will more than likely have a completely different view on each name that you would choose. That is why the name generator on the app is fantastic, the list of names runs in alphabetical order and has over 18,000 names included. You can shake the phone to be presented with a random name or you can search for boys or girls names. You can even search for names by meaning, origin and my favourite… theme! Theme opens up a criteria such as geeky, celebrity or even traditional. The name generator certainly shakes the naming game up and puts some fun into what can sometimes be a stressful discussion between Mum and Dad. 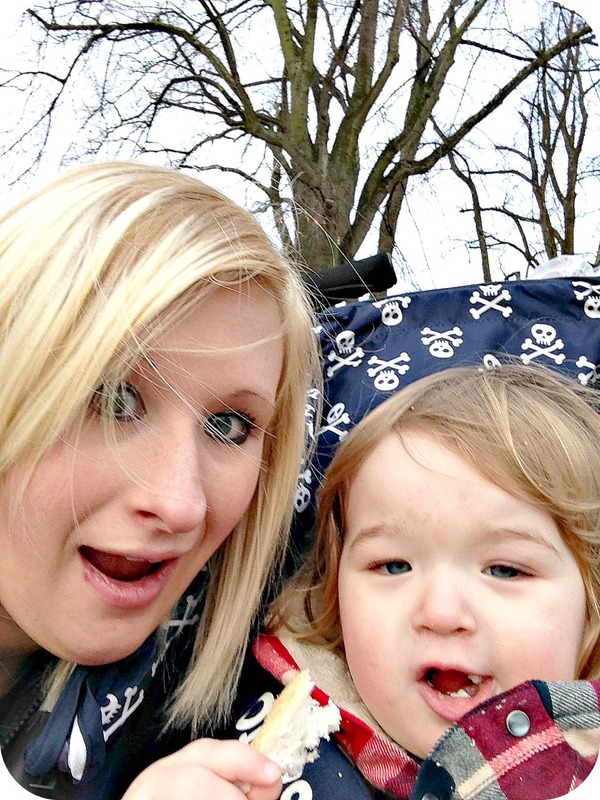 There is a link to the Mothercare Blog through the app, so it is easier than ever to see what is going on over there and with life experiences from around 12 bloggers each giving a unique insight into parenthood you may just find yourself nodding along in unison. 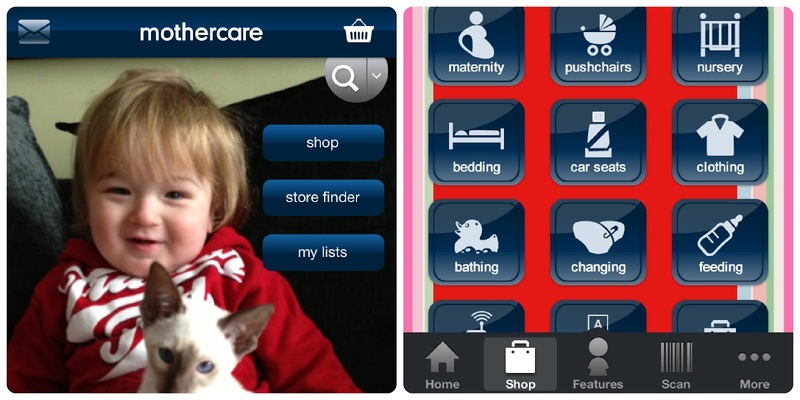 The new Mothercare App is completely free to download and really is fantastic. So why not download it today and take a look for yourselves!? The start of a New Year always starts with good intentions and resolutions that we wish to implement so that we can make this year ‘our’ year. Some people are taking the start of 2013 as their chance to lose weight or cut out sugar in their tea, but there are some who are putting their pennies aside for a rainy day and looking for a new way to save. As a child I used to put my spare change into a piggy bank, and it is surprising just how quickly that loose change can change its value. To this day I still have a money pot to put my pennies in and it usually comes in very handy whenever I am on the hunt for change to pay for my car parking ticket! Of course serious saving is more than putting your loose change in a pot, but by looking into a bank account with a high interest rate you can begin to make some more pennies from your hard earned money. Saving your money opens up new doors to exciting new places, maybe you can book that once in a lifetime holiday that you have dreamt about since you were a child, buying that very first home for your family, or what about that new car? There is always the option of putting your money into a pension to fund your retirement. Saving now will put you in good stead for the future when you want to say goodbye to the world of work altogether and enjoy the luxuries of life. Now after being in my job for 4 years I am yet to sign up to their pension scheme, however with the new auto-enrolment programme that is being introduced by the government, all employers are legally required to put forward all employees into a qualifying work place scheme if like me, they are not already in one. NOW:Pensions have released an insightful infographic taking into account the biggest ever pension shake up with the introduction of auto-enrolment. But what is the attitude of British workers on saving for their retirement? I have never been a worrier, well that was true until I had Leo. I seem to worry about Leo every waking hour of every day, it’s like I am constantly running risk assessments in my minds eye. I feel like we are living in this protective bubble, but I worry that at any given moment someone could pop it, and just like that we would be exposed to the elements that only nightmares are made from. I worry about things that haven’t happened or have a very low risk of actually becoming a reality. I know that it is a Mother’s right to worry but sometimes I really do over think things, and sometimes I find myself lying there at night willing myself to go off to sleep, but the thoughts just keep going round and round in my head. As he got older and Leo began to move around his Granddad liked to make ramps out of cushions for him to crawl up and down. My heart was constantly in my mouth; I could see him toppling off the side and onto the floor but no one else could see my worries. And in fear of sounding like an over protective Mother I kept my mouth shut and looked on in case I needed to catch him! If we go on a road trip I am paranoid about every other car on the road, I cling on for dear life when we venture onto the motorway, which may just be because of Luke’s driving… But to me every other car on the road is a potential danger to my family, to my little man. I don’t relax until we get where we are going. That being said, I personally point blank refuse to drive on the motorway, I never have and I never will. I am not the most confident of drivers and I really feel that I would just be putting Leo and I in harms way. We stick to what we know and toddle about on the less busy roads! When Leo was 5 months old we went to Tenerife and Luke was in charge of driving a hire car in a foreign country. This of course meant that Luke had to adapt to driving on the other side of the road…And boy, I was terrified! I did not want to get in that car with Leo and I very almost didn’t. Luckily my fears were un-founded and bar the odd near miss or two Luke got us around the island in one piece. I hate to leave Leo any longer than I have to; when I am home I am with him. I very rarely leave him except for work and certain events where I cannot feasibly take him with me. When it comes to letting anyone have him over night at any place other than ours I just can’t do it, I worry too much if he will wake up and wonder where I have gone. This rule does not apply so much for my parent’s but I think that is because we lived with them for so long. But when we have offers from his Nanny who lives about half an hour away from us I have to say no, at least until his is old enough to understand why he is going there over night. Now I know I sound like I am the most over protective, dramatic parent of them all. 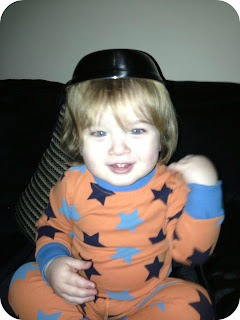 But that is not the case, of course I let Leo do things but I just like him to do these things under my watchful eye. I like to be there and I want him to know that I am there for him if he does take a tumble. So for now I will keep my worry hat on and hope that this bubble we are happily bobbing along in keeps us tightly encased inside. Here’s to a happy and healthy 2013! 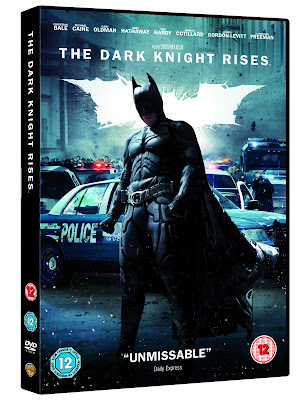 Just before Christmas Warner Bros. very kindly sent us a very generous Blu Ray collection, and among the discs was The Dark Knight Rises. Now I personally have never in my entire life watched a single Batman movie. Luke on the other hand has seen them all. Now I will be honest, if I hadn’t been sent this Blu Ray to give my personal opinion on and Luke had not nagged me like he did to watch it, then I probably wouldn’t have. I had already ordered Luke to go on his own to watch it when it hit the cinema screens last year…But I decided that I should give it a go and see what I thought. I know so little about Batman and his character that about 10 minutes into the film I asked Luke if Bruce Wayne was Batman, only to be met with the tell-tale glare insinuating that I was asking silly questions. 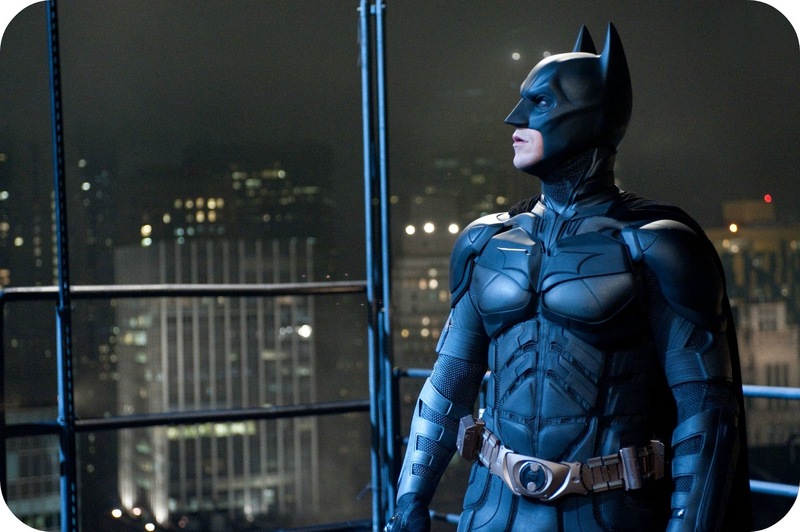 The Dark Knight Rises follows on 8 years after the Dark Knight film concludes and peace has fallen upon Gotham. Batman took the fall for policeman Harvey Dent’s murder and has since hung up the costume for good. Selina Kyle (cat women) is a jewellery thief or cat burgler if you prefer! She appears posing as house help in the Wayne mansion only to later sneak into his private quarters and steal Bruce’s Mother’s locket, out of the safe that Wayne has been informed is unbreakable. Bruce, putting his Batman days behind him becomes withdrawn from the real world and confines himself to Wayne Manor. Bruce is a shell of his former self, frail and his business in a weak financial footing, but with the arrival of a new evil force named Bane, Batman is forced to consider whether his retirement is founded or not. Bane is a scary looking man with voice to match, and he is planning to take over Gotham city and expose the truth about who Harvey Dent really was. Of course Batman rises to the occasion as any true superhero would and protects Gotham against Bane’s evil wrath. Batman’s return is not welcomed by the police who still believe that he is responsible for Harvey Dent’s murder and it soon becomes evident that Batman has very few allies and people he can call upon. Overall I let myself enjoy the film even though it is not usually the kind of genre that I would personally choose. At 2 hours 45 minutes long I did find it a bit tedious at times having not seen the films predecessors. 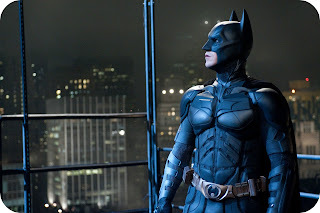 However the Dark Knight Rises is certainly a well-made film with many twists and turns, some of them predictable and some of them completely out fo the blue. 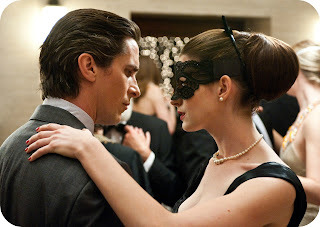 Each member of the cast put on a good show, I have to admit I thought Anne Hathaway was great as cat women, always making you question who’s side she was really on and what her ultimate goal was. The plot had depth and from what Luke tells me concludes the Batman story, however from what I could see they were not shutting the door completely on Batman, and I wouldn’t be at all surprised if we were to see another Batman film in the future. You can purchase your own copy of The Dark Knight Rises from Amazon. 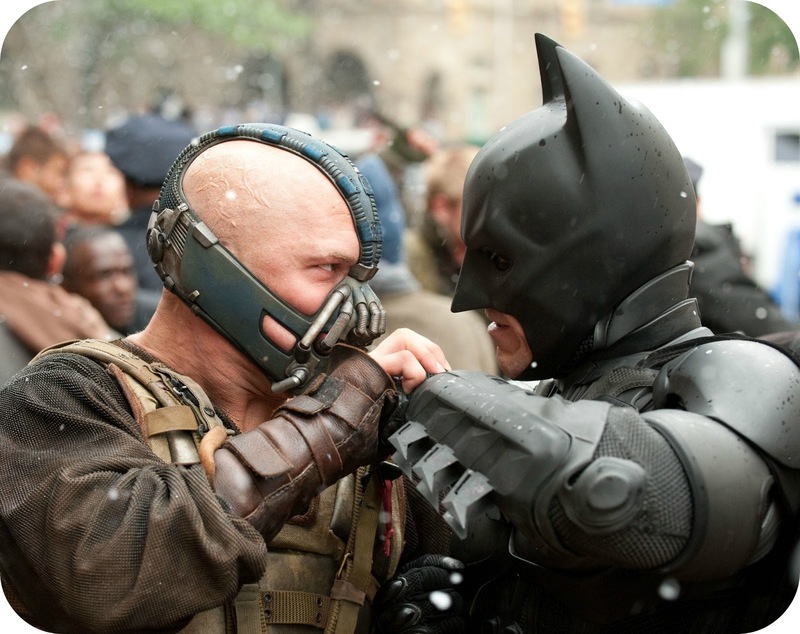 Disclaimer: I was sent The Dark Knight Rises for the purpose of this review. However all views and opinions expressed are completely honest and my own. Last year I told you all my exciting news about being picked as a Panasonic Intelligent Living Mum. Back in December we had our second meeting, so all 10 of the chosen Living Mum’s descended upon Bracknell to visit the Panasonic Head Offices. 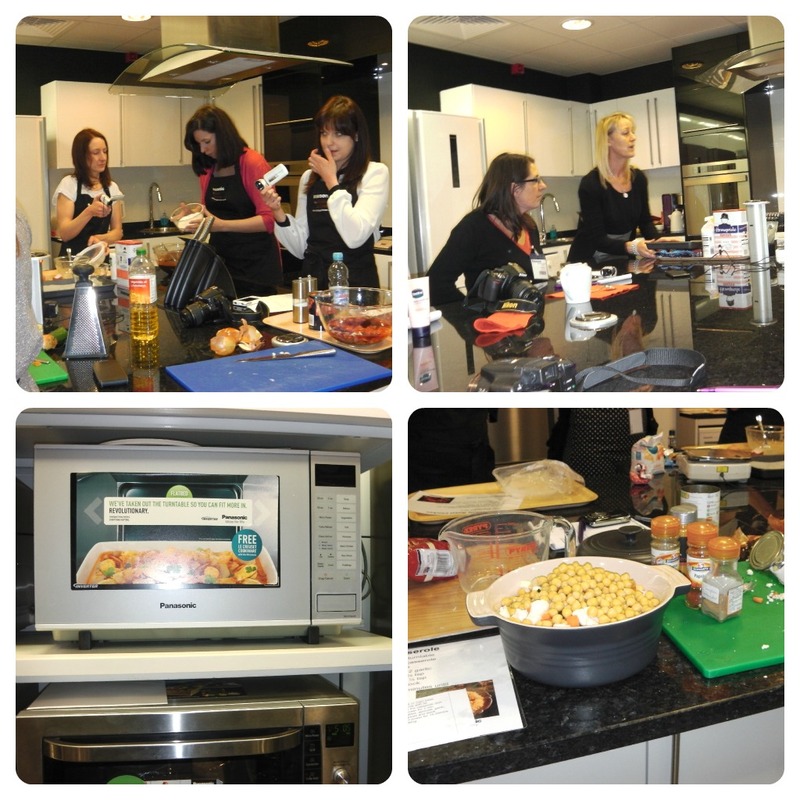 It was fantastic to see everyone again and having now met everyone once before it gave us more time to jump straight into the task at hand, and on this occasion it was Microwave Ovens. Now up until this visit to Panasonic I thought a microwave could simply heat up food and savage the meat you are trying to defrost, or that could just be the microwave that we inherited…. However my view on microwaves has now well and truly changed, and for the better! 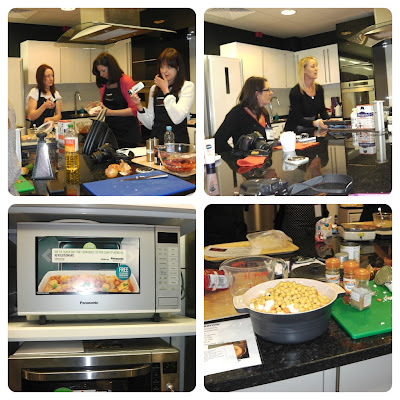 The session was very hands on and we all got assigned different recipies to cook up in the combi ovens, there was roast chicken, brownies, mince meat and a vegetable curry! I did ponder how we were going to achieve some of these ambitious recipes in a microwave, it is just didn’t seem possible. 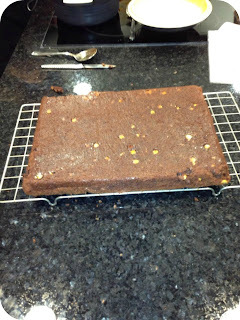 But roast a chicken they did, and bake brownies…they did! Using the combi technology of the convection oven, grill and microwave the chicken roasted in a mere 50 minutes and was succulent, crisp and juicy. It had come out perfect. Straight out of the microwave! My job was to cook up a cheats Bolognese, and it could not have been any easier. If you are in need of a quick dinner then the sheer convenience factor is well deserved. - Cover the bowl and place in the microwave on high for 10 minutes. - Take out and stir, re-seal and place on medium microwave for 10 minutes. Viola…Dinner is served. 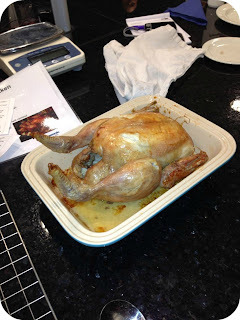 The preparation time was minutes and the finished results were incredibly tasty, even if it was cheating! 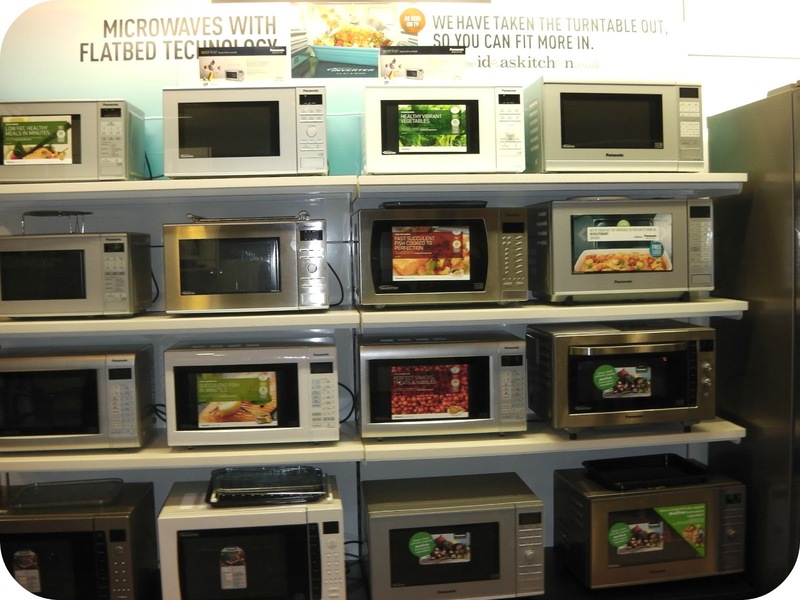 I have to say that I was completely oblivious to how far microwave technology has come in the last decade, I had of course heard of these new fancy microwave ovens but I had never seen or had the opportunity to try one out personally. 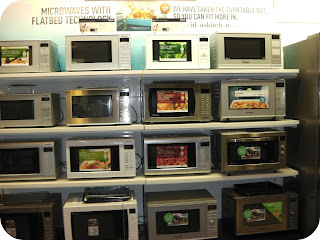 I went in completely sceptical but after seeing exactly what these microwaves can do, I am completely converted. I arrived home and excitedly told Luke all about these fantastic machines, he looked at me like I had lost the plot, and maybe I had. However Luke is now completely on side, he has seen first hand exactly what can be achieved with a combi oven. Ever since Panasonic sent us our very own NN-CF771 to try out, I have used it everyday. Most days I don’t even need to turn on the oven, as I can do absolutely everything with my combi, and I do. It is so easy to use and I would go as far as calling it fool proof. I will be sharing some of the yummy recipes that I have been cooking up off the Panasonic Ideas Kitchen over the next couple of weeks as I try out new things. Disclaimer: I had my travel costs covered to be in attendance, however all views and opinions expressed are completely honest and my own. Warner Bros. really know how to spoil a girl, and in preparation for the Christmas period they sent me a Christmas stocking full of treats and one of those treats was the new release New Years Eve on Blu Ray. New Years Eve is a film that you could compare to Love Actually and Valentines Day in the way that the story of each character is some how intertwined, everyone knows one another in one way or another. There are new lives being born at a near by hospital and with the race on to have the first baby of the New Year, two couples do everything they possibly can to win the cash prize that is awarded to the first baby of the year. Lives are also coming to an end at the hospital where Stan Harris (Robert De Niro) is in the final stages of cancer. Stan’s last wish is to see the ball drop at midnight one final time. The Vice President of the Times Square Alliance is making the final preparations for the big ball drop at midnight, of course… If it can go wrong then it will go wrong and of course when the ball starts to head to the top of it’s peak, it gets stuck. The President (Hilary Swank) wonders what on earth they will do and with the help of an insightful engineer Kominsky, who decides to assist despite being sacked by the company a few weeks prior, he mends the ball just in time for midnight! But will Stan get to see the ball drop? There are so many stories within this movie, love stories and revelations that always come at the end of one year and the start of the next. Midnight kisses and mystery strangers, people assisting others in their time of need. A highlight of the film for me was where Randy (Ashton Kutcher) and Elise (Lea Michele) get trapped in a lift together. 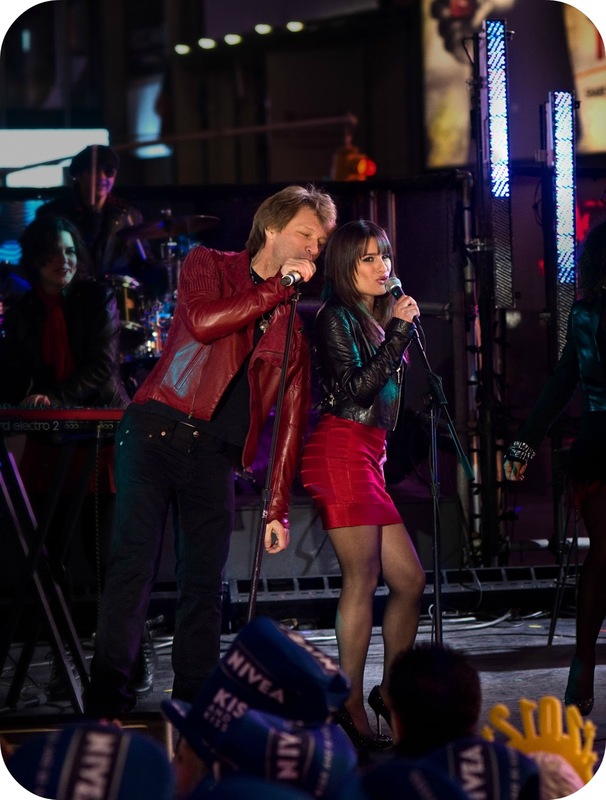 Elise has not long moved into the building where Ashton is living and is on her way to sing back up with Jensen (Jon Bon Jovi) at his show in Times Square. Things heat up in the lift for the two stranded and when they finally get out, Elise runs off to make her show, followed closely by Randy. Elise ends up singing solo in place of Jensen who is off rekindling his relationship with his ex girlfriend. 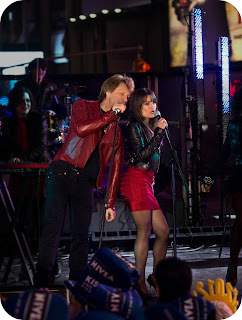 Lea’s performance of Auld Lang syn is just beautiful and hearing her sing it blew me away! New Years Eve highlights the magic and glitz of that one big night that sets the scene for a brand new year. I can’t say it is my favourite film of all time but it is certainly enjoyable and worth a watch. 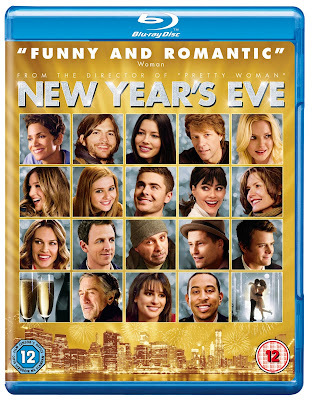 It is the perfect film for a quiet New Years Eve in if you don’t fancy the hustle and bustle that accompanies it. The entire case is made up of some big names such as Zac Efron, Halle Berry, Michelle Pfeiffer and Sarah Jessica Parker just to name a few! You can purchase your own copy of New Years Eve from Amazon. Disclaimer: I was sent New Years Eve on Blu Ray for the purpose of this feature, however all views and opinions expressed are completely honest and my own. For decades we have been finding ways to share our life experiences in the future, history dictates the findings that have been found on cave walls and of course marked in the ancient tombs of Egypt, we know so much about past events because people have taken the time to tell us in their own special ways with the means that they had available to them. Although we have evolved we are still seeking ways in which we can share our stories, only these days it is a far cry from the markings we used to leave upon cave walls. These days we blog for the very same reasons that those before us told their stories through pictures compiled out of mud, we want to share our hopes, dreams and aspirations. We want our most treasured memories to live on and maybe help others through our mistakes and experiences. I like to think that one day Leo and I will sit down together and go through every last little bit of our story, because that’s what this is. It’s our story. I want him to see how far he has come and everything that we have done together. I like to think that one day when I am old that I will find some comfort in the words that I once wrote, that even though Leo has grown up and has children of his own, I will still have every memory, every adventure and every bedtime story. You never know what is around the corner and that really is a scary thought, I hate the thought that one day I could just be gone through no fault of my own and Leo would lose all of the memories that I hold for him. That is why my blog is so important to me; it is my gift to Leo so that he will always have every memory that I cherish for him. It will be here for him, and it will be here for me. I have captured so much in his short life, from the first time smiled to the time he rolled over, his first tooth to his first crawling attempt. The first time he belly laughed we caught it on video and it hasn’t stopped there, he then went on to take his very first steps and got even cheekier. Of course there have been moments where I have been at my witts end and I have sought advice, there have been moments where he has been poorly and kept me up all night long, but our whole story is always unfolding, there is so much that is still un-written. Some of you know that I have been taking a weekly photograph of Leo and that we have been doing it ever since Leo was born. I shared his first year with you back in June when Leo turned one and we are still actively taking these photographs. I think they capture so much and with each passing week as Leo’s story grows, so is he. He changes all of the time and I am going to capture every moment and share them on my very own cave wall in the hope that we can live on through our memories and aid families going through similar experiences. 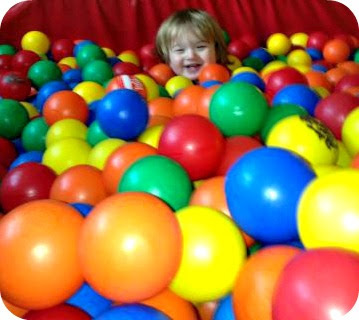 Leo and I were invited along to a rather playful event back in November. Lush kindly opened their lovely perfumed doors to a mass array of parenting bloggers so that the children (and of course the parent’s…Okay mainly the parent’s) could have a play with their new product. FUN. Leo and I met up with the lovely Bex over at The Mummy Adventure and her little one Dylan, so that the kid’s could enjoy each other’s company. Both the boy’s head straight for the table with all of the different coloured FUN layed out ready to be played with…and began eating it. In unison they scrumpled up their little faces and began to cry, because even though it smells good enough to eat. It isn’t. After this both Leo and Dylan did not want to eat or drink anything else in the fear that it may possibly be soap, but of course that didn’t last long and they were soon trying their luck with the FUN again. Us Mummy’s seemed to grasp the play factor to be had with the FUN over the toddlers, at 15 and 16 months back in November they were a little bit too young to understand what to do with it. But looking around the room all the grown ups and the older children were having a wail of a time, constructing all sorts of fantastic colourful creations. 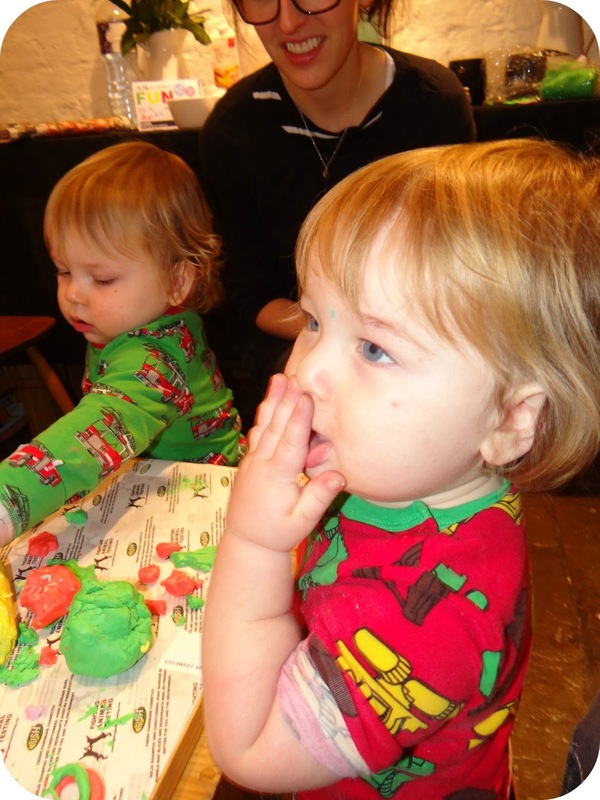 Leo and Dylan became more interested when it came to smashing the creations back up, and we were soon left with marbled FUN with all sorts of bright colours. Let’s not forget though that FUN is not just to be sculptured with. Oh no. 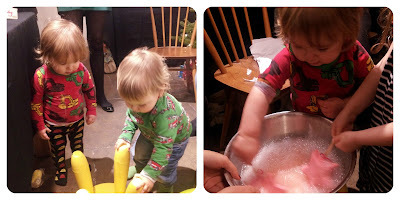 You can then wash with your creations; the FUN dissolves in water producing a lovely bubble bath. It can be used to wash your hair, hands, and face, everywhere! 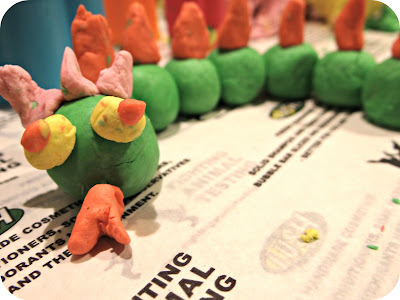 Disclaimer: We were invited along to a demonstration at Lush Covent Garden where we got to have a hands on play with the FUN. We were provided with nibbles and a goody bag for being in attendance, however all views and opinions expressed are completely honest and my own. On the run up to the festive period I have certainly indulged, I mean… it would be rude not to! Right!? To set the scene and get into the festive mood, Leo and I have sat together and taken in Christmas films for the very first time. Granted he soon got ants in his pants but it was the perfect moment for those minutes that he was engrossed in the film. So one evening on the run up to Christmas when Leo was tucked up in bed, I enlightened Luke and put on the Polar Express for my non believer! As expected Luke was not a fan, Scrooge seems to have stood firmly inside of him…But I enjoyed it just as much as I had done the very first time I had watched it. The next morning when Leo awoke and we looked outside to see the rain falling, yet again! I snuggled up on the sofa with my little man and I watched it for the second time in as many hours. Leo soon became engrossed in the animation, and although he is too young to follow the story line he enjoyed it all the same. 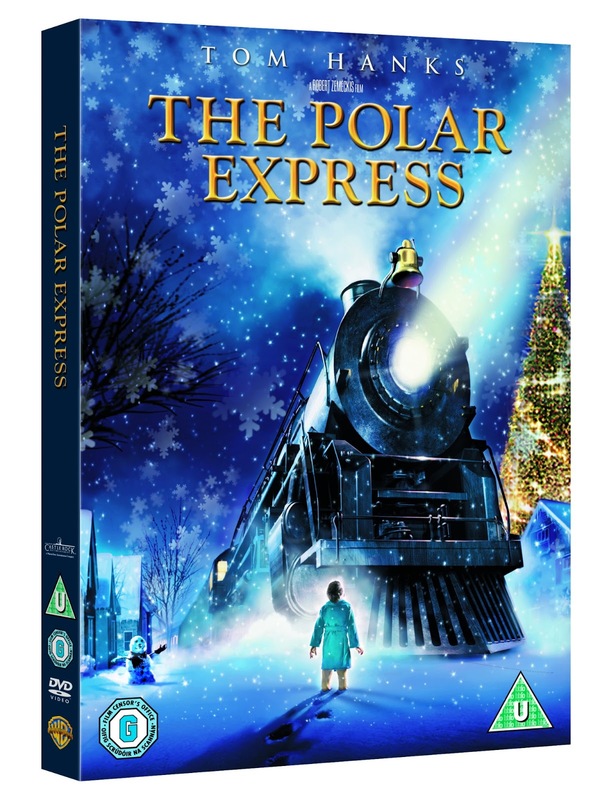 For those of you who have not seen The Polar Express, firstly…Why on earth not!? Secondly Why, why, why!? The Polar Express is a magical film that rekindles the believer in old and young alike. Late on Christmas Eve night a young boy lies awake in bed hoping to hear Santa’s sleigh bells so that he can re-confirm his belief in Christmas, and in Santa. Instead of sleigh bells though a loud steam engines whistle sequels outside his bedroom window. The boy runs outside to see what all the commotion is about and is soon greeted by the train conductor (Tom Hanks) who invites him on board the magical train that is headed directly to the North Pole. During the magical train ride the young boy fathoms whether he is dreaming, he ponders whether the magic of Christmas exists and is verging towards non believer, despite him wanting to desperately believe. The journey to the North Pole takes the boy on the most magical adventure of his life and opens up a door of self discovery to life lessons that can be applied to each and every single one of us ‘the wonders of life never fade for those of us who truly believe’. The very first time I watched this film was around the time it was released on DVD back in 2004, and I remember falling in love with the story then and there. It is one of those films that I could watch year after year and I still adore the story as much now as I did back then. By the end of the movie I get those all familiar butterfly’s in my stomach, the good kind that make you feel excited and despite being a grown up lady with a child of her own, I love that I can still get excited by the magic of Christmas. Next year when Leo and I sit down to watch it I know he is going to interact with it on a much higher level than he did this year. But we will be getting ourselves a hot chocolate and snuggling up together to watch this classic film again year after year. You can purchase your own copy of The Polar Express on Blu Ray for £8.00 from Amazon. Disclaimer: I was sent the Polar Express for the purpose of this feature however all views and opinions expressed are completely honest and my own. I'm a Baby get Me Out of Here!